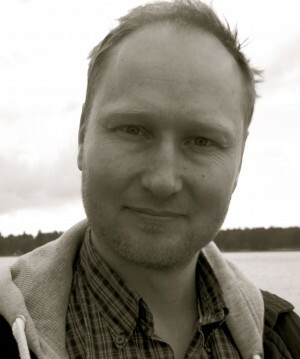 Let’s start with an introduction: Who is Rjurik Davidson? That sounds like an existential question. The kind of thing that Jean Paul Sartre would spend his time contemplating. We are what we do, Sartre would have responded. As for me, I’ve always tried to live a varied life, and have done many jobs. One of my qualities is curiosity. I love learning new things. There’s too much to know in this world. My interests include from quantum physics, ancient history, political theory, psychology and psychoanalysis. I’ve lived around the world (Australia, the US, Europe), worked as a cook, clerk, lecturer, and builder. I speak French, though unevenly. I love to see things I’ve never seen before. I love to meet unusual people. I’m very loyal but don’t often forgive people who have treated me poorly. Your debut, Unwrapped Sky, will be published in paperback by Tor in the UK, in March 2015. How would you introduce the novel to a potential reader? 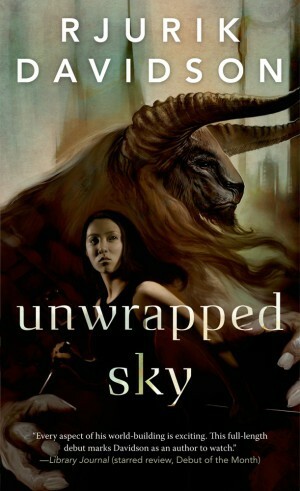 Unwrapped Sky sits somewhere between fantasy and science fiction, in a little subgenre sometimes called the New Weird. It’s set in the fantastic city of Caeli-Amur, which is something like an industrial version of Ancient Rome. Steam trams chug along the streets. A ruined forum lies close to a huge arena. Three dictatorial Houses rule the city. It’s filled with strange wonders. Ancient Minotaurs arrive for the traditional Festival of the Sun and New-Men bring wondrous technology from their homeland. Hideously disfigured Wastelanders stream into the city and strikes break out in the factory district. The novel tells the stories of three people. The philosopher-assassin Kata has debts that need settling and will do anything to ensure they’re met. The ambitious bureaucrat Boris Autec rises through the ranks, turning his back on everything he once believed, and soon his private life turns to ashes. The idealistic seditionist Maximilian resolves to overturn the oppression dominating the city, and hatches a mad plot to unlock the secrets of the Great Library of Caeli Enas, drowned in the fabled city at the bottom of the sea. Unwrapped Sky is a novel of adventure and suspense, but also – I hope – a book that has something to say about oppression and liberation, progress and destruction, gender and class, love and betrayal. Though Unwrapped Sky can be read as a stand-alone novel, a sequel is out later this year. It’s called The Stars Askew and it too can be read as a stand alone, but it continues the story of Caeli-Amur’s revolution. There are some spoilers for those who want to read Unwrapped Sky, but for those who have, the publicity material reads: With the seditionists in power, Caeli-Amur has begun a new age. Or has it? The escaped House officials no longer send food, and the city is starving. When the moderate leader Aceline is murdered, the trail leads Kata to a mysterious book that explains how to control the fabled Prism of Alerion. But when the last person to possess the book is found dead, it becomes clear that a conspiracy is afoot. At its center is former House Officiate Armand, who has hidden the Prism. Armand is vying for control of the Directorate, the highest political position in the city, until Armand is betrayed and sent to a prison camp to mine deadly bloodstone. Meanwhile, Maximilian is sharing his mind with another being: the joker-god Aya. Aya leads Max to the realm of the Elo-Talern to seek a power source to remove Aya from Max’s brain. But when Max and Aya return, they find the vigilants destroying the last remnants of House power. It seems the seditionists’ hopes for a new age of peace and prosperity in Caeli-Amur have come to naught, and every attempt to improve the situation makes it worse. The question now is not just whether Kata, Max, and Armand can do anything to stop the bloody battle in the city, but if they can escape with their lives. The idea for Unwrapped Sky came many years ago. Initially I wanted to write a story where the magicians of a city were oppressed. It would be a story of their liberation. At the time I didn’t know quite how to write it, so it sat in my notebooks for ages. The initial impulse for the world of Caeli-Amur came from reading a New Wave writer, Samuel R. Delany. There’s a scene in The Einstein Intersection, one of his ‘science fantasy’ books, with an underground ruined bunker of some sort. The opening of the novel read like fantasy, then suddenly there was this ancient ruined technology and I thought, “Whoah, what’s this?” I then went to Clarion South writers’ workshop and wrote a broken story set in Caeli-Amur, which emerged in a white-hot week. Michael Swanwick was the tutor that week and gave it a ‘Swanwicking’, which I was all the better for. When I returned to Caeli-Amur, it was waiting for me. Suddenly I knew how to write that novel about the oppressed magicians, though it turned our quite different from how I imagined as a twenty-year-old. As far as inspiration goes, I think you get it from the things you loved – especially as a child. If an author were to do a list of the things that fascinated them as a child, I’d say a fair number of them would make an appearance in their fiction. For me, this included labyrinths, lost books, myths and legends, magicians and robots and stories of heroes venturing to lost lands, ruins and archaeological sites. I loved ancient societies – Greece, Rome – and historical fiction about them. When I was a bit older, I became interested in the history of revolutions, especially the way that the revolutionaries could never be the embodiments of the new world they wanted to create. They were forced into all kinds of moral quandaries. So you see all of that in my fiction. 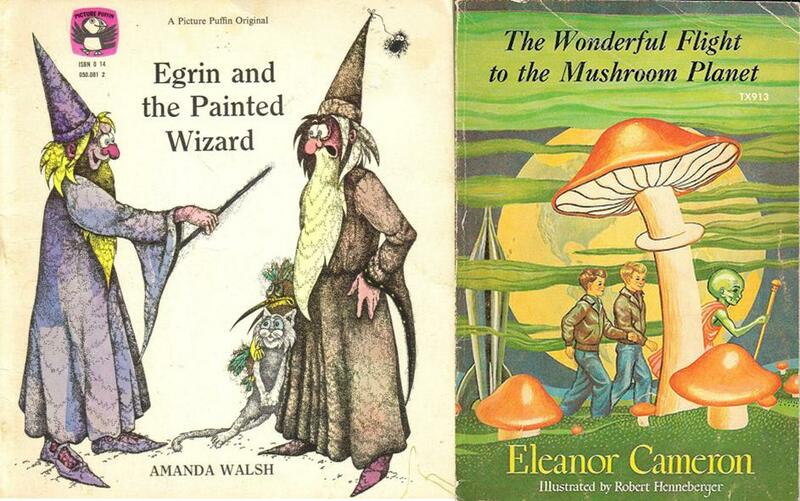 As a child, we all read genre: fairy tales and stories of wizards and spaceships and so on. I had wonderful a book called, Egrin and Painted Wizard, about a wizard who paints another magician, who then comes alive and who turns out to be evil. I also had a book called The Wonderful Flight To the Mushroom Planet, about two boys who meet a scientist. The scientist sends them to a place called the mushroom planet. I can’t recall what happens, but it was amazing to my five-year-old mind. There was a time in my early twenties when I didn’t read much genre. But apart from that I never stopped. I love writing full-time, but it’s not always easy. The ebb-and-flow of contracts and money is hard. The publishing industry itself is under severe pressures, of course, and that contributes to the difficulty many writers face. But as a job, it’s a dream! I get to live many lives. A ‘real one’ and the lives of my characters. I always write first thing in the morning. For me (and there’s some research to suggest this is true for most people), it’s important to focus on your most important opportunity at the very beginning of the day. That’s when we have most energy. I started writing as a child, stopped for a while, returned to it in my early twenties. At sixteen I wanted to be in a rock band. Not unusual for a teenage boy, but later on I played with some really good musicians and as Dirty Harry says, “A mans got to know his limitations.” There was a period there in my late teens, early twenties when I sort-of drifted around directionless. But slowly I settled on writing. It was a calling from the beginning, even if I ignored it for a while. From then on it’s been fairly steady as a writer, I suppose, though I haven’t been wildly prolific. A lot of my writing has been non-fiction: people can read some of that on my website. I’ve probably got a book’s worth of essays, not counting online pieces. Maybe someday someone will want to publish a book of those. Anyway, I’m someone who crosses genres and modes. I’m not just a fantasy writer, but also write SF, surrealism, magic-realism. I’m not just a fiction writer, but write essays, screenplays, and am planning a non-fiction book. I don’t think of any of these as separate in any way. In my head, they’re all part of the same project. My first writings were copies of Tolkien or the other tales I was reading at the time. They’re all gone now, I think, but yes, I’m very fond of them. I like that little boy who was so excited when he wrote them. That’s a minefield of a question, you know. The genre is puttering along. Like all of publishing, it’s facing challenges. In my mind, there are too many commercial pressures on it. The search for profit is always a destructive thing, because when profit comes into conflict with human needs, or the environment, or art, it always wins out. This means, for example, that lots of wonderful ‘mid-list’ writers are really struggling. That’s a terrible pity, because it’s usually those niche writers who are doing the best, most interesting work. I’m on the more challenging part of the spectrum, I’d say. Some people say that my work is a bit like Gene Wolfe’s or Jack Vance’s or China Miéville’s. Unwrapped Sky plays with genre, breaks it at places. Some people find this upsets their ideas of what a genre novel should be. Others love it. 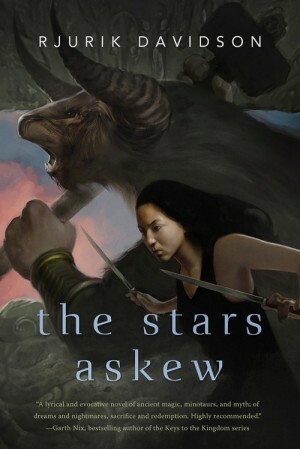 The Stars Askew is off to the editors. I’ve pretty much finished up with The Rusted Earth, which is gaslight fantasy. The main character is a suffragette librarian – Eugenie Healy – who works at the National Museum in Melbourne. In this alternate Australia, there is still an inland sea and much of the megafauna – giant lizards and diprotodons (giant wombat-like mammals) – still survives. Readers of my story ‘Int. Morgue. Night.’ (from my collection The Library of Forgotten Books) might recognize this setting, though the action in the novel takes place in the 1890s, not the 1950s. As a result of the sea, there has been a massive influx of migrants. Readers can expect to encounter opium dealers and spiritualists, Chinese junks sitting in the harbour, industrialists in the halls of a powerful men’s club, a rural utopian community who have rejected the modern technologies, the hideout of one of the last bushrangers, a ruined ancient city in the desert – and automatons, of course. I’m also working on a bunch of new short stories. I really want to get back into story writing. The Book of Universes, by John D. Barrow, about multiple universes. 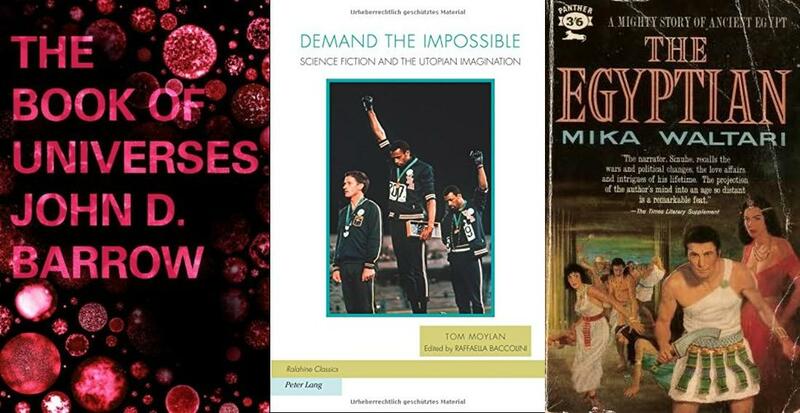 Tom Moylan’s academic book on utopias, Demand The Impossible, and Mika Waltari’s The Egyptian. They’re all great in their own way. Getting some of my short stories and novelettes out, I think. I’ve about five on my computer, in various states of completion. When they’re done, I’ll also have enough for another collection, so I’m hoping a kind publisher will think it worthwhile putting that together with me. Some of my old stories deserve to be remembered, I think. Caeli-Amur: an ancient city harbouring hidden mysteries, ruled by three warring Houses. Once, the gods used magic ­- or thaumaturgy – to create reality. Now, under the oppression of the controlling classes, that magic seems like a dream. But things are changing in Caeli-Amur. Ancient minotaurs arrive for the traditional Festival of the Sun and New-Men bring wondrous technology from their homeland. Hideously disfigured Wastelanders stream into the city and strikes break out in the factory district. Three very different people may hold the key to the city’s survival but only if they can put aside their own personal vendettas. The philosopher-assassin Kata has debts that need settling and will do anything to ensure they’re met – but can she put a price on the ultimate betrayal? Meanwhile the ambitious bureaucrat Boris Autec rises through the ranks, turning his back on everything he once believed, and soon his private life turns to ashes. Elsewhere, the idealistic seditionist Maximilian resolves to overturn the tyranny dominating the city, and hatches a mad plot to unlock the secrets of the Great Library of Caeli Enas, drowned in the fabled city at the bottom of the sea. In a novel of startling originality and riveting suspense, these three individuals risk everything for a future they can only create by throwing off the shackles of tradition and superstition. As their destinies collide, the destruction will either transform the ancient city . . . or ruin it.